Fr. 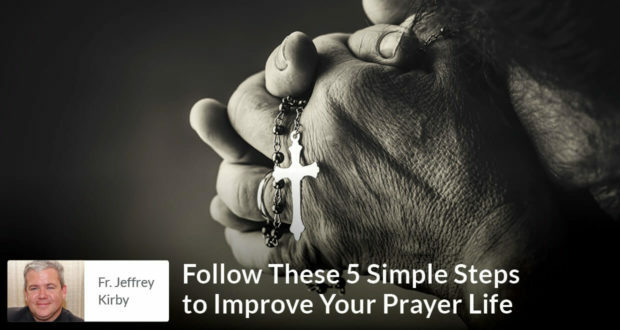 Kirby’s five simple steps will help us stay close to the Lord during our busiest times. Simple but effective – each will lead to a deeper prayer life. So much is going on in our lives and the world. Amid these activities and responsibilities, how are we to stay close to the Lord? How are we to pray? Here are five steps that can help. The first step is to acknowledge we are not the ones who initiated our desire to pray. God summons us to himself. When we wish to pray, God is already working within us. This should be a great consolation and encouragement to us. It is an opportunity to calm our concern and deflate our anxieties on how to pray or whether we’re praying right. God is already working in us, and he will guide our efforts to pray. After recognizing that God is calling us to pray, our next step is to develop a habit of prayer. This is a humble but very necessary step. We must create a habit. Attach it to an existing habit. For the habit to stick, it must be slow and practically achievable. For example, maybe the goal of praying five minutes a day could be a great start. The second point is as important. Sometimes, new habits are lost just by plain forgetfulness, or from willful laziness or distraction. By attaching our daily five minutes of prayer to an existing habit, we ensure it will be remembered and we will fight to get it done. For example, we can attach our five minutes of prayer to taking a shower or brushing our teeth in the morning. The forming of a habit is essential because our prayer life cannot grow and mature without it. When we pray, we can say whatever we want. There is no such thing as a bad prayer. When we begin to pray, the most important thing is we are praying. To help us when we begin to pray, we can do what we do best in our fallen nature; namely, we can just complain! We can open our hearts and just let God know about our struggles and disappointments. As our habit strengthens, we can change our complaining into thanksgiving. We can thank God for all his blessings. Eventually, our five minutes can become ten minutes. We can also pause and let God speak to us. In forming our habit of prayer, we deepen our understanding that prayer is about relationship and covenant, and not about a “to do” list for God. We see that prayer is about asking God what he wants from us, and not asserting what we want from him. In time, our ten minutes can become fifteen or twenty minutes and then we can use different prayer forms from the Church’s spiritual treasury to help us deepen our prayer and more clearly hear the Lord speak to us. When our prayer life becomes dry, it’s important we understand what is happening. Some might think that when prayer becomes difficult or dry, they are doing something wrong, they have offended God in some way, or something in that arena. What is happening in these moments? What is God doing? This part of the spiritual life is the purgative way. The expression reflects the reality: we are being purged in these dark times of prayer. God is removing the consolation and teaching us to love him for himself and not for the blessings we receive from him. In the purgative way, God has moved from “soul triage” to “soul surgery.” In this process, he is teaching us dependency and trust. We should not fear these moments. Even as we wrestle, the spiritual masters teach us that God is closer to us in our purgation than our times of consolation. God is doing more in our souls than we could ever imagine. Our task is to persevere and let God work. The purgative way usually concludes with an illumination of some form. The Lord imprints knowledge within us in a profound way. This could include a mystical awareness of love, mercy, hope, healing, or other areas we need in our discipleship. No Christian ever prayers alone. In Christ, we are also surrounded by the saints, who are the friends of God and our older brothers and sisters, as a “cloud of witnesses” helping us (Hebrews 12:1). They encourage and pray for us. They inspire us and model the Christian way of life for us. We never pray alone. In our life of prayer, it is very good to find a prayer partner or join a prayer group. For those in Holy Matrimony, their God-given prayer partner is their spouse. It is utterly essential that married people pray together, and that Christian families pray together. Parents are the first and graced spiritual directors of their children, the royal priests of the domestic church, and as such they must teach their children to pray. The Christian family is called to be an oasis of prayer, showing our fallen world the face and compassion of God. In conclusion, each of these five simple steps is meant to help us in our busy lives. They are meant to guide us in our life of prayer. Each step is intended as counsel along the way of life and from the trenches of the Church to assist each of us in developing or deepening our interior lives. Fr. 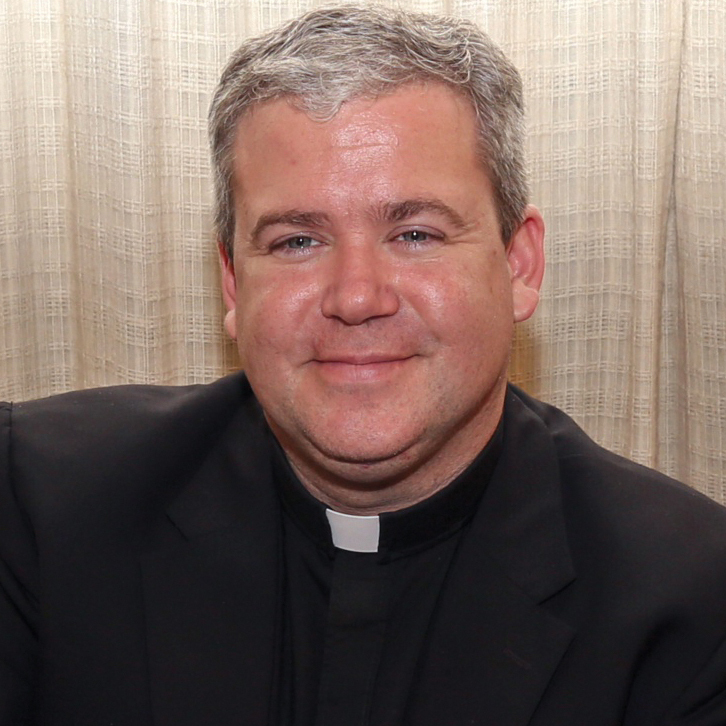 Jeffrey Kirby, STD, is the Administrator of Our Lady of Grace Parish in Indian Land, SC. He holds a doctorate in moral theology from the Holy Cross University in Rome and is the author of the book, "Lord, Teach Us to Pray". Father Kirby is a strong advocate of homeschooling and actively supports the Our Lady of Grace Homeschool Co-Op at his parish.